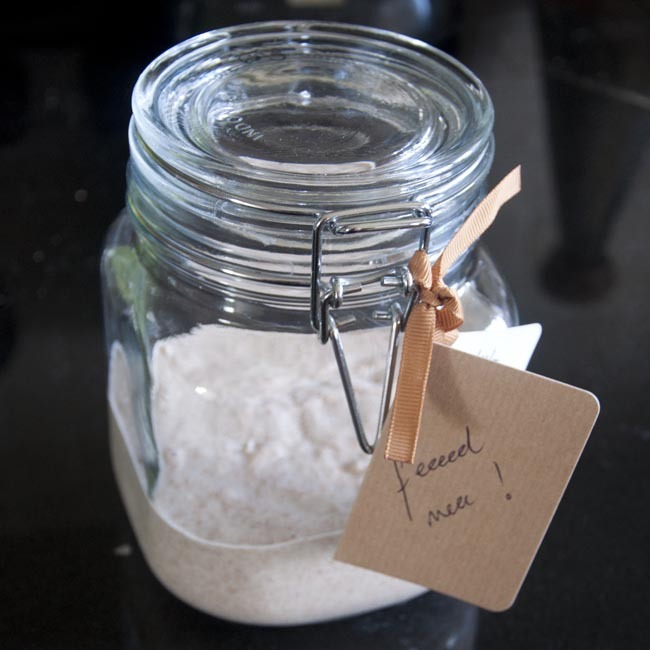 This entry was posted in Baking, Bread, Experimental, Gift ideas, Housekeeping, How-to, Slow Food, Sourdough, Twitter and tagged bread, country skills, food, gifts, home produce, how-to, sourdough, traditions by Kate Watson. Bookmark the permalink. Thanks for the pet big sis, we’ve called it Seymore. So far it’s been rather naughty. It seemed quite happy in the fridge this week – though it did develop a layer of greyish liquid that I threw away before it’s warming snack. I did wonder: should I use or avoid any specific types of utensil? This evening I’ll try to make up a sponge with spelt flour. I’ve now made up my overnight sponge – using spelt. Now I just have to be patient … not really my style I know – but here goes. I used a plastic bowl – would I have been OK using a metal one? And is it just me or is it necessary to clean anything that touches the starter immediately for fear it turns to wholemeal concrete? Sounds like it’s all fermenting nice and vigorously then! Looking forward to seeing a photo of the slow-motion-starter-explosion! Oops! I was very surprised at how it behaved in the tea-towel lined bowl. I had really expected a tea-towel flowery wholemeal concrete mess – whereas it really turned out politely into the stoneware pie dish I’m using as a baking container. Incidentally – what should I be using?